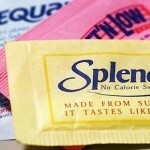 Aspartame, why you want to avoid it... like the PLAGUE!!! Aspartame has been around for several decades now, and for the most part, millions of its users have no idea of how dangerous this food additive is. If you are currently consuming aspartame in ANY of the 6,000 plus products it’s found, you will want to read on. Aspartame Is By Far, the Most Dangerous Substance On the Market That Is Added To Foods. Period!!! Aspartame is the technical name for the brand names, NutraSweet, Equal, Spoonful, and Equal-Measure. Aspartame was discovered by accident in 1965, when James Schlatter, a chemist of G.D. Searle Company was testing an anti-ulcer drug. Aspartame was approved for dry goods in 1981 and for carbonated beverages in 1983. It was originally approved for dry goods on July 26, 1974, but objections filed by neuroscience researcher Dr John W. Olney and Consumer attorney James Turner in August 1974 as well as investigations of G.D. Searle’s research practices caused the US Food and Drug Administration (FDA) to put approval of aspartame on hold (December 5, 1974). In 1985, Monsanto purchased G.D. Searle and made Searle Pharmaceuticals and The NutraSweet Company separate subsidiaries. Aspartame accounts for over 75 percent of the adverse reactions to food additives reported to the US Food and Drug Administration (FDA). Many of these reactions are very serious including seizures and death as recently disclosed in a February 1994 Department of Health and Human Services report. (1) A few of the 90 different documented symptoms listed in the report as being caused by aspartame include: Headaches/migraines, dizziness, seizures, nausea, numbness, muscle spasms, weight gain, rashes, depression, fatigue, irritability, tachycardia, insomnia, vision problems, hearing loss, heart palpitations, breathing difficulties, anxiety attacks, slurred speech, loss of taste, tinnitus, vertigo, memory loss, and joint pain. Aspartame is made up of three chemicals: Aspartic acid, phenylalanine, and methanol. The book, Prescription for Nutritional Healing, by James and Phyllis Balch, lists aspartame under the category of “chemical poison.” As you shall see, that is exactly what it is. Aspartate and glutamate act as neurotransmitters in the brain by facilitating the transmission of information from neuron to neuron. Too much aspartate or glutamate in the brain kills certain neurons by allowing the influx of too much calcium into the cells. This influx triggers excessive amounts of free radicals which kill the cells. The neural cell damage that can be caused by excessive aspartate and glutamate is why they are referred to as “excitotoxins.” They “excite” or stimulate the neural cells to death. Multiple sclerosis (MS), ALS, memory loss, hormonal problems, hearing loss, epilepsy, Alzheimer’s disease, Parkinson’s disease, hypoglycemia, AIDS dementia, brain lessions, and neuroendocrine disorders. The risk to infants, children, pregnant women, the elderly, and persons with certain chronic health problems from excitotoxins are great. Even the Federation of American Societies For Experimental Biology (FASEB), which usually understates problems and mimics the FDA party-line, recently stated in a review that “it is prudent to avoid the use of dietary supplements of L-glutamic acid by pregnant women, infants, and children. The Existence of evidence of potential endocrine responses, i.e., elevated cortisol and prolactin, and differential responses between males and females, would also suggest a neuroendocrine link and that supplemental L-glutamic acid should be avoided by women of childbearing age and individuals with affective disorders.”(4) Aspartic acid from aspartame has the same deleterious effects on the body as glutamic acid. The exact mechanism of acute reactions to excess free glutamate and aspartate is currently being debated. As reported to the FDA, those reactions include:(5) Headaches/migraines, nausea, abdominal pains, fatigue (blocks sufficient glucose entry into brain), sleep problems, vision problems, anxiety attacks, depression, and asthma/chest tightness. With this information, it is my hope that you all consider reverting to healthier alternatives to sweeteners. Organic honey is one great alternative, with many proven health benefits.